You’ve looked at other author websites and you know what you like and don’t like. Now you have a pretty good idea of how you want your author website to look and function. But making your ideas a reality isn’t always easy. The experts at Web Design Relief know that effectively communicating with your web designer can mean the difference between getting what you want and being disappointed with the results—which is something that neither of you wants. If you’re an author who wants to sell books, you’ll want your book front and center. You’ll need a Buy Now button. And you should supply your design team with the highest quality, largest image available of your book. But if you write short stories or poetry or don’t currently have a book to promote, you may want the website’s focus to be about your bio, your process, and your publication history. Knowing what your main goal is will help your web design team determine how to set up the pages on your website. Give an overview of style and format. Your author brand is important. It’s why your readers are following you instead of another writer. So it’s essential you have a website that reflects the image your fans expect. Before you sit down with your design team, do your homework. Find examples of websites that have a similar aesthetic to what you envision for your own website, and show these to your designer. Explain which elements you like on these websites so that the designers have a better idea of what to focus on when developing your site. Images are a vital part of website design, so if you have specific images you’d like to use, you should let your designer know at the beginning. There could be many reasons why your preferred images can’t be used, such as blurriness, potential copyright issues, or simply not working with the genre you write in. So the sooner your designer can address these issues, the better. You might consider choosing royalty-free stock images from websites like http://shutterstock.com. Or you can let your designer make the choices for you based on your preferred website examples. After all—that’s what they do! Have a recent headshot ready for your author website—and if it’s a professional headshot, even better. Check out ways to get great results in your author photo. Be ready for a reality check. Your vision of the perfect author website may not be technically feasible. Website design is advancing every day, but it still has its limitations based on the template and management system on which your site is being built. Not all templates accept all plugins. There may also be limits based on your budget. If you’re paying for a basic, no-frills website, you shouldn’t realistically expect all the bells and whistles. And just because a big, splashy banner works well selling expensive couture jewelry doesn’t mean it’s what your readers expect to see when they visit your author website to learn more about your poetry or cozy mysteries. Don’t give vague input: I don’t know, whatever you think is best. While web designers are experts and will have definite ideas about what works and what doesn’t for your particular needs and genre, leaving every choice up to the designers without giving them direction means they will have to guess at what you want. If you were secretly wishing for an image of foreboding cliffs beside the ocean for your mystery author website and the designers give you a castle in moonlight, there’s a chance you may not be happy with your website design. Your designer wants to make you happy, and effective communication is key to making that happen. You’ll understand any limitations, and the design team will understand the aesthetic you want for your readers. 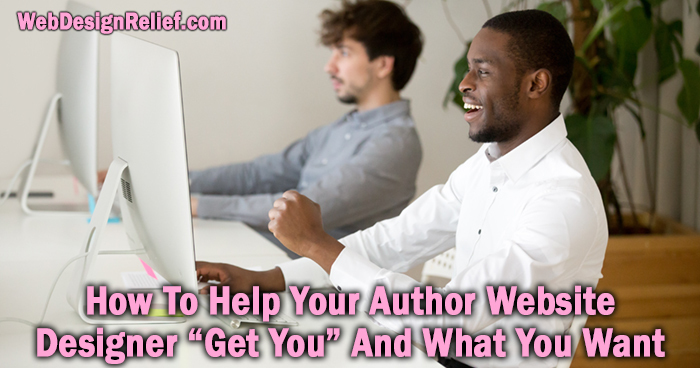 Working together, you can create an author website that works perfectly for you! Question: What do you think is the most important thing to tell your web design team?